Seventy-five teachers from three Jewish day schools in Greater Hartford came together one day earlier this month to share techniques for teaching innovation – a key area of eduation for students in an increasingly integrated, fast-paced world. Hosted by the Hebrew High School of New England in West Hartford and organized by Rabbi Eliot Feldman, head of school at the Bess and Paul Sigel Hebrew Academy of Greater Hartford, the day-long conference demonstrated the expertise within the faculty itself, with sessions led by faculty from the three schools – which includes, in addition to the Hebrew Academy and the Hebrew High School, Solomon Schechter Day School of Greater Hartford. Sessions ranged from exploration of applied technologies to strategies for improving study skills to teaching specific aspects of the Torah. The joint professional development day was born of a new collaboration among the three schools, made possible by the Day School Transformation Fund. 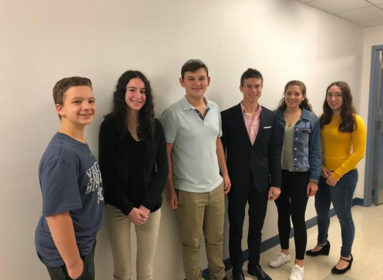 Part of the Aim Chai Endowment Campaign – which is led by the Jewish Federation of Greater Hartford and the Jewish Community Foundation of Greater Hartford – the fund is aimed at strengthening and accelerating the curricular developments at the schools. The goal of the Day School Transformation Fund is to create integrated curricula for science, technology, engineering, arts and mathematics, and help the three participating schools provide students with an unbeatable combination: the academic rigors of STEAM and the critical thinking and ethical grounding of Judaics. Sessions at the day-long conference were led by faculty from the three schools and ranged from exploration of applied technologies to strategies for improving study skills to teaching specific aspects of the Torah. Through the fund, the schools have a new partnership with the Connecticut Science Center and are working on others. CAP: Dr. Raye Mutcherson, a physics and biology teacher at Hebrew High School of New England, and Susan Kurtis, a social studies teacher at Solomon Schechter Day School, compare notes during a collaborative session.